If you’re like me and were eight years old when Transformers first hit the scene then chances are that you’ve been waiting for this movie for close to 20 years. I’ve been loyal follower of the Transformers TV show and toys since that fateful Christmas Eve when my aunt gave me my first Autobot, the good old break-dancing fool, Jazz. So it’s no small wonder that I needed to see just what Michael Bay would bring to the table. Early info had me scepticle. Michael Bay did direct The Rock, a great action flick, but he did also direct Pearl Harbor… I was torn. This could be a disaster by all means until I heard two names; Steven Spielberg and Industrial Light and Magic. Even if Bay directs a POS of a movie, Spielberg and ILM will at least make it look and sound amazing. Now for the meat and potatoes. Transformers is a visual and sonic masterpiece. The Autobots and Decepticons punch, kick and tear each other to shreds as they should and they look so good doing it. It is so visually seemless that I never questioned they’re presence in the scene. They are big and clumsy, break the ground when they walk, and even manage to drag empathy from us as we watch them kill each other. 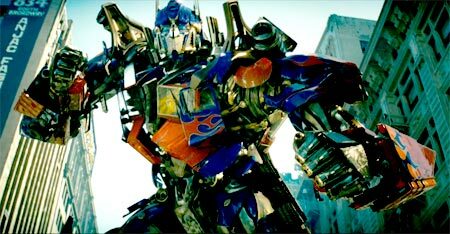 One scene in particular where Optimus Prime (leader of the good guy Autobots) ivisurates a bady actually mad me cringe as if I just saw a kid kick a puppy. The battle scenes are a whirlwind and my only critism is that I was never given a breather between pummeling. Hell even a Tyson fight has rounds. Oh yeah, are there are actors in this movie? Actually there are and the first 15 minutes play out like an 80s teen movie with Shia LaBeouf as teen loser Sam Witwichy trying to get close to jail bate extrodineare, Megan Fox. We also meet a battalion of US grunts in the Middle East who… aw screw it. I give you Megan Fox. You are welcome.